Aimed at B2 level, the version reviewed is published in 3 slim volumes, with 4 units in each. 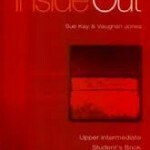 It replaces the familiar Inside Out for upper intermediate. Review pages are included after each group of 3 units. The division into A, B and C volumes would be useful for short courses, although if the books are used for this purpose, the review pages would be better at the end of each volume. Each volume ends with a Grammar Extra section, a useful glossary page, tapescripts, phonemic symbols and a list of irregular verbs. Each unit starts with a note of grammar, vocabulary and useful functional phrases to be covered in the unit. Grammar and vocabulary are introduced through listening and reading texts, followed by the usual gap-fill tasks and discrimination exercises. Content, pictures, etc. have been updated, although they may still date quite quickly, e.g. at the start of Unit 1 we see Prince Charles, William and Harry in 1997. Writing tasks are included, with models of text types provided. Speaking tasks take the form of anecdotes, rather than truly communicative activities. Overall, there is a greater focus on idiomatic and functional language than in the original. In my view, it is more suitable for use with young EFL learners than with ESOL learners. The focus on skills work and idiomatic usage means it would need to be supplemented for FCE preparation classes. A range of supplementary materials include a CD-ROM for interactive practice, a DVD extending the topics in the student’s book, a newly designed website and a digital version of the student’s book which integrates audio and video material.